The National Weather Service is forecasting precipitation to move into the state tomorrow (Tuesday) around 12 PM and overspread the whole state by early evening. The northwest may see all snow with accumulations up to 10” (worst case scenario). Central, eastern and northeastern Massachusetts may start with snow and then see a transition to rain and then back to snow with accumulations of 3” to 6” (worst case scenario), and the southeast may see mostly rain with up to 2” of accumulating snow (worst case scenario.) The precipitation will end on Wednesday morning, and will be followed by a period of extremely cold temperatures from Wednesday afternoon to Friday morning. 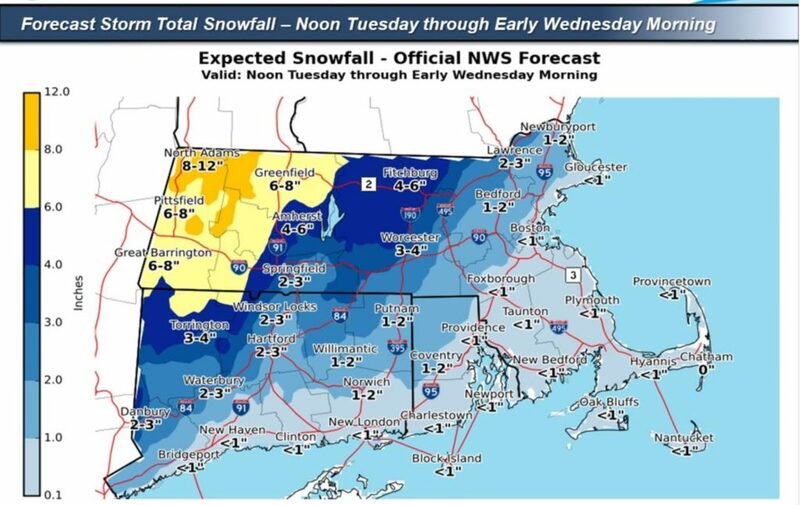 The WINTER STORM WATCH continues over northern and western portions of MA with the expected accumulating snowfall for Tuesday afternoon into Wednesday morning. To clarify why we held with the WATCH. It is entirely possible the associated storm system could move through faster and we could get less. It is also possible that the heavier precipitation / snowfall outcomes occur outside of MA, more across northern areas of New England. While there is concern of travel impacts outlined below, there is still not a high level of confidence with this forecast. 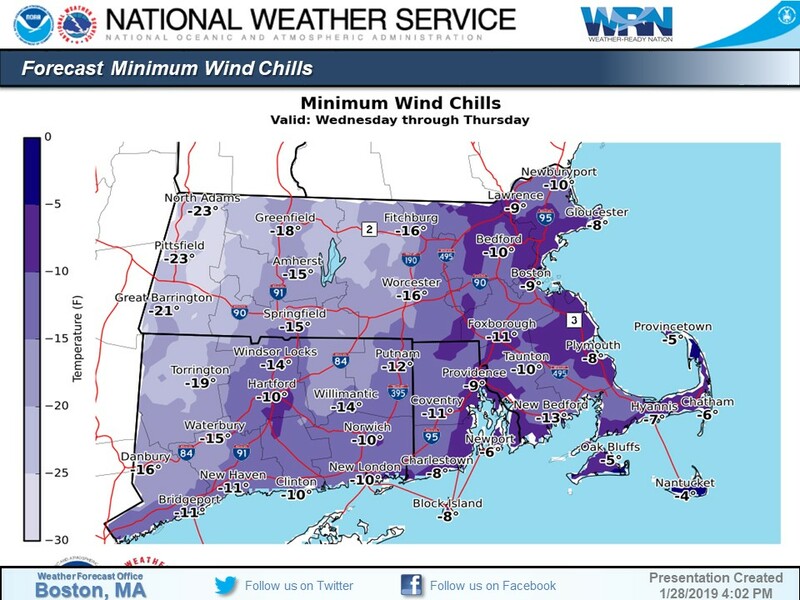 Behind the snows, bitter cold and dangerously low wind chills follow for Wednesday into Thursday. 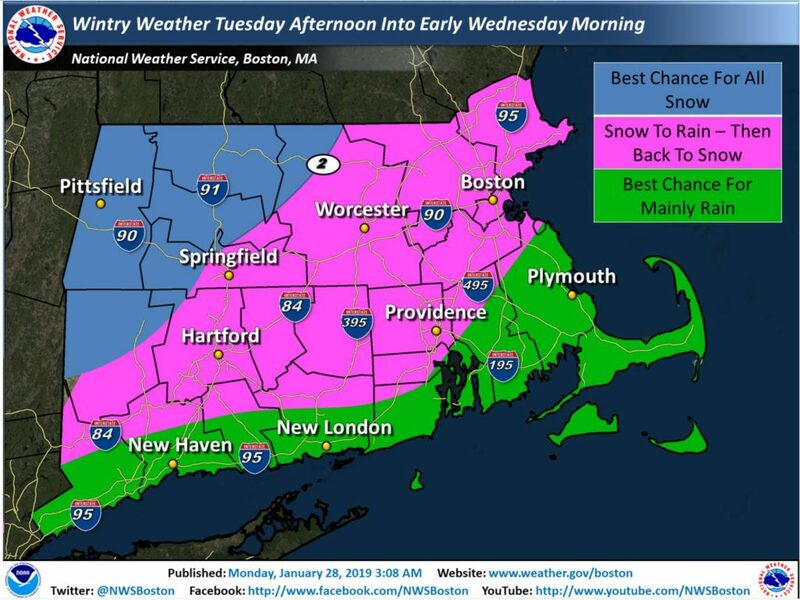 Timeline … broadly speaking, beginning around noon Tuesday for the CT River Valley, encompassing eastern MA by early evening; becoming moderate, possibly heavy at times over northern / western MA early evening Tuesday to shortly after midnight Wednesday before concluding into early morning Wednesday. Challenges with respect to the rain / snow transition line, monitoring the Hartford – Worcester – Boston corridor especially. Impacts … slick conditions on untreated roads and hazardous travel, especially for the Tuesday afternoon into evening commute. Watching closely the I-91 corridor throughout CT & MA, as well as the western-halves of I-90 and Route 2. Timeline … developing towards noon Wednesday as Arctic air surges into the region per westerly winds with gusts up to 40 mph; especially Wednesday night into Thursday, dangerously cold wind chills could continue through Friday morning while bitter cold persists into Saturday. Impacts … with greater exposure to the elements, roughly 30 minutes, there is the risk for hypothermia and frostbite. Can’t rule out isolated issues with freezing pipes. Marine Impacts … moderate freezing spray forecast with gales and wave heights up as high as 8 to 12 feet, expect dangerous conditions for all vessels, even those properly equipped for Wednesday through Thursday. Biggest challenge is nailing down the exact evolution of the rain / snow line which will ultimately determine snowfall amounts and outcomes. In addition, there is a measure of uncertainty concerning snowfall amounts, whether meeting or exceeding 3″ advisory / 6″ warning level criteria for particular counties, hence the continuance of the WATCH.